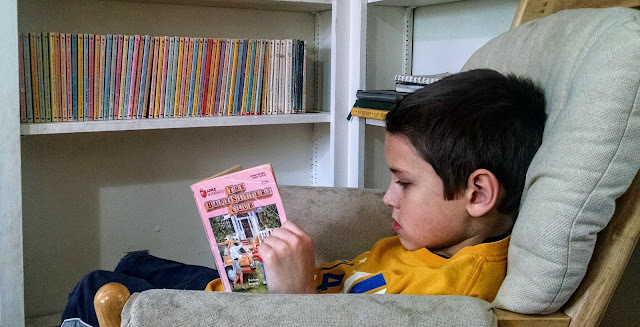 Benjamin has torn through the Babysitters Club books this past summer, and has continued to reread some of them this school year. When I tell people he's reading them, they're kind of incredulous. He is a seven-year-old boy, after all. Not the target audience. :) But they're good books and my mom brought me my whole collection when she came to help us move. I thought my collection had been donated them to the library! So it was a pleasant surprise to see the books again. I knew I had to keep them in easy reach for Benjamin for a couple of reasons: Because I loved them at his age, and because if I suggested that he read them I knew he never would. The only way to get him to read them would be to have them in easy reach. They're so colorful and appealing, how could anyone resist? And I think they're books worth reading! I learned a lot about babysitting and childcare from reading them. And Ann M. Martin won the Newbery Honor you know, for her book A Corner of the Universe. She's a good writer. Sidenote: I got to see her speak once. I wrote a little about it here. 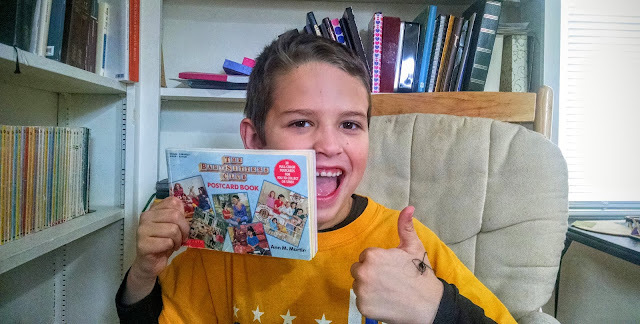 My point here is that I have had such a great time watching Benjamin read the books.The things he has said have made me laugh and really taken me back to my babysitters club days. Whether we were learning about the pop culture of the past or discussing the real-life issues the series talks about, we've had a great time. 1. "Stacy has diabeets." Hey, if I had never heard anyone pronounce the word diabetes, I might think that's how you said it. 2. "Logan is an associate member of the Babysitters Club. He doesn't have to go to meetings." Ah, I had forgotten that Logan was an associate member! Haha. Of course I had not forgotten about Logan. No, indeed. One of my first literary crushes. 4. "I want a peanut butter sandwich. Kristy and Mary Ann had peanut butter sandwiches at lunch and Dawn said, 'That's so Connecticut'." Order up! I would be happy to assist you in solidifying your identity as a resident of Connecticut by making you a PB&J. 5. "What does it mean 'tie up your parents' line?" We had a great little dinner table conversation about how telephones used to work. You could see the light bulb come on over his head. "Oh! So that's why Claudia has a private line!" 6. One day I was doing my makeup in the bathroom. In pops Benjamin. "Bart wants to go steady with Kristy." "Does she want to go steady with him?" I ask, not wanting to give anything away. "We don't know!" he says. "She didn't answer him and then next book is not a Kristy book. So we probably won't know until the next Kristy book! Unless someone mentions it out loud..." Oh, the suspense. 7. "Dawn has two holes in each ear, but Claudia has one in one ear and two in the other..." Oh man. Now I know why I was so obsessed with ear piercings when I was in elementary school! I remember that I couldn't wait to get my ears pierced (my parents made me wait until I was eight) and that pretty soon I was dying for a second piercing (never happened). I had not realized the ear piercing discussions in The Babysitters Club were influencing me all along. If you can get a 7-year-old boy excited about how many holes 12-year-old girls have in their ears, you know that's persuasive writing. 8. "Claudia reads Nancy Drew mysteries but she hides them because her parents don't approve..." Ha! I had forgotten that. Nobody could forget that the Kishi's are a model of disapproving parents, but putting the kibosh on Nancy Drew? That's when you know they're supposed to be ridiculously disapproving. 10. "Who are the three stooges?" This of course led to some YouTube education. 11. "What if Watson Brewer came to our lemonade stand . . ." We were having a lemonade stand one Saturday, and received a generous donation. This let us to speculate about what Kristy's rich stepfather would do if he stopped by. 12. "I should have known!!!" This random exclamation near the end of one of the books caught me off guard. Benjamin went on to explain that now that he knew the twist, he could easily see the book's foreshadowing. 13. 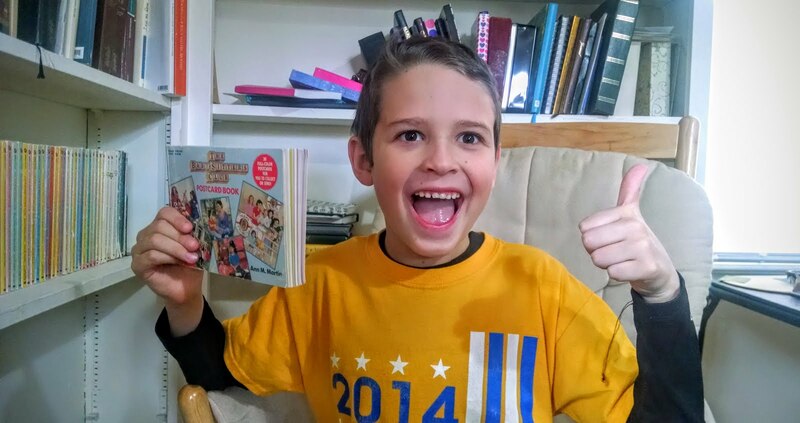 "It takes me about 7 minutes to read a chapter; and there are about 15 chapters in each book, so it takes me about two hours to read a Babysitters Club Book." Not only does Benjamin love reading, he loves math. 14. "What's The Monster Mash?" This one comes up in Kristy and the Secret of Susan, when autistic-savant Susan plays it on the piano. This led to a discussion about autism, and a monster mash dance party. Which one of these made you smile? And what book or book series do you remember fondly from childhood? One person who comments will win a BSC postcard from me and Benjamin. Contest ends 3/31/16. Congratulations to commenter Cami! You have won! 13. "It takes me about 7 minutes to read a chapter; and there are about 15 chapters in each book, so it takes me about two hours to read a Babysitters Club Book." I loved comment 13 too, because that is soo Benjamin! I also liked the one about Logan, it reminds me of Lewis in the H2O Just Add Water TV series - he is my favorite character. And were you only 8 when you got your ears pierced? I thought I held out til at least 10 or 12. Oh I forgot to tell you one of my favorite series when I was young. Tarzan novels by Edgar Rice Burroughs. What adventure! Ah, Classic Benjamin moment! :D I've never read Tarzan! Did you ever read Baby Sitters Club Little Sister books? I was all over those! I didn't, but Benjamin has bumped into a few of them and read them! We found one on the library's free shelf, and another one somewhere else... I saw at least ten of them at the Groton Goodwill last week! "What does it mean to tie up your parent's line?" Ha ha! Sometimes I forget how much the world has changed even in my lifetime. I wasn't as in to The Babysitter's Club, but I think I must have read every book in The Bobbsey Twins series. Good for him reading all of those! I've been suggesting to Katy for awhile that she could read the Babysitters Club books, but she was never interested. A few weeks ago we came across the first Babysitters Club graphic novel. Both girls read it and then Katy said, "Maybe I should read the real book now."